Last edited by assfly on Mon Feb 11, 2019 11:24 am, edited 1 time in total. Love the pic of Stormer PSDT! All the saffer matches in 1 fred? yup. They are never played at the same time and just keeps it tidy and ouboet wont dredge up old threads and the match threads are barely populated . But in the week leading up to the game it's going to be a mess. People posting about 3-4 games in 1 fred. In a RWC year, fans will want to keep up to date on players form and injuries. I'll keep my eye on all the teams, but mostly on the Sharks as I'm always informed that they have the best players. Since the Sunwolves is comprised of 90% saffas, it's not really rooting for a foreign team against a saffa one if we pull for the sunwolves in this one is it? The Sharks have suffered another blow ahead of their first Super Rugby outing this weekend after utility back Curwin Bosch was ruled out with a shoulder injury. We were just managing Rob (Du Preez junior), you know he is coming back from playing overseas, but we were probably going to start with Curwin in Singapore, but he got injured now,” he said. All the Sharks big hitters are crocked. The Cell C Sharks probably couldn’t have asked for a better preparation for a match in Singapore than the drawn warm-up match against the Blue Bulls played in what was reportedly uncomfortable Ballito humidity. The Sharks and Vodacom Bulls drew 7-7 at a school ground in the KZN north coast town, with defences apparently dominating as the two teams completed the preparations for this coming weekend’s opening to the 2019 Vodacom Super Rugby season. 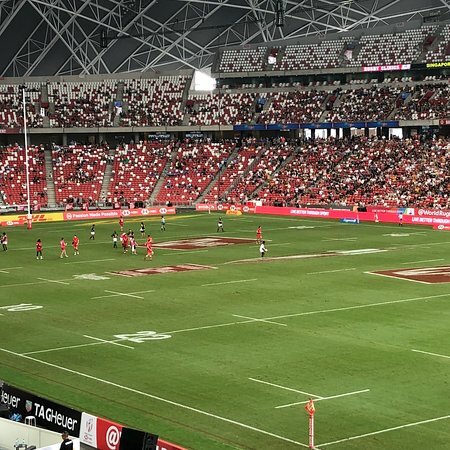 While the Bulls will host the DHL Stormers in Pretoria in the big match locally, the Sharks start out on the road by playing the Sunwolves in Singapore. “The focus is now on the Sunwolves game in Singapore. It will be a tough game for us, so this was a perfect warm-up opportunity for us in terms of the humidity (we can anticipate in Singapore),” said Sharks coach Robert du Preez. As he did after the loss to the Lions in Cape Town the week before, Du Preez lamented missed opportunities.“We did again let a few opportunities slip through our fingers in the second half,” said Du Preez after the game. I think the Sunwolves have a couple of token Kiwis. Although easy opposition, it's the first game of the season in the energy sapping heat and humidity of Singapore. I'm not expecting a vintage display here. If you have insomnia, just make a recording of this game. It will put you to sleep. Yes, traditionally a very dull game. Last edited by Jensrsa on Wed Feb 13, 2019 8:09 am, edited 1 time in total. You have to understand the context...handy is talking from his experience last year. And you need to remember that he is used to seeing scores in the 50 to 60 region. Where did I talk about history, boet? I'm talking about the upcoming game? Can we discuss the Stormers on the Stormers fred please? The Sharks were involved in a very exciting 7 all draw in similar conditions already this year. Just demonstrating how you talk out of your arse, boet. I make a prediction about the weekend's game and you dig up history to demonstrate how I talk out of my arse? I'll let you think about this for a while. Problem is, we don't have a back up flyhalf here. are sharks going to be wearing their Wakanda shirts for this ? or was just for he warm up games ? cool. what about the Reds game in April, as I saw Reds have an Iron Man shirt ? We are in Deben next weekend, asked her if she wants to go to the Blues game............very quick "No, why don't we watch it on TV and have a braai and you can drink a bit instead?" Sounds like a keeper boet!